Network Rail must ensure Christmas engineering work ends on time to avoid a repeat of the chaos of overruns last New Year, regulators have warned. The Office of Rail Regulation said the company needed to win back public confidence after late work affected the West Coast main line and others. Network Rail was fined £14m for the overruns, which included a four-day delay to work at Rugby, Warwickshire. Regulators say the firm now needs to show it has addressed such failings. Thousands of passengers were affected by the delays on the busy London to Scotland route at the end of 2007 and the beginning of 2008. 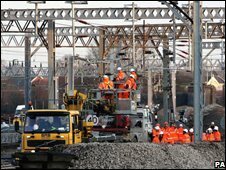 Network Rail (NR), which is responsible for infrastructure, conceded at the time that the work had overrun because specialist workmen failed to turn up for work. There was also disruption in London, when delayed work at Liverpool Street station forced it to close, just as people tried to return to work after the Christmas break. More work on the West Coast main line at Milton Keynes, Buckinghamshire, is among the engineering projects going ahead over the festive period this year and the Office of Rail Regulation (ORR) urged NR to ensure it was fully prepared. The ORR also reminded the company it would have to comply with an order issued earlier this year "to address the failings in the way it carried out engineering projects". Bill Emery, the ORR's chief executive, said: "Engineering work on the railways is vital... but NR knows it is required to reduce the amount of disruption caused by its engineering projects and avoid the sort of overruns we saw last year." He said passengers and freight users would see the benefits of the improvements brought about by the long-running work on the West Coast line. But, by a timely finish to the work scheduled for this year's Christmas period, NR would show it had "responded positively to the challenges posed by this programme", he said. He added: "It can further help re-establish public confidence in its work by completing its Christmas engineering plans on time." The warning comes as the ORR revealed that NR had reduced the number of delays caused by infrastructure problems - they were 9.8% down on the same time last year. After receiving the fine in February, NR chief executive Iain Coucher said his company had put "military-style" command posts in place, and pledged the delays suffered by passengers over New Year would not be repeated.